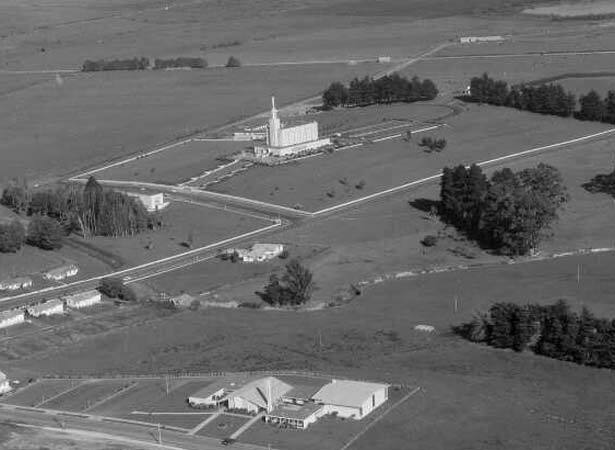 This was the first temple of The Church of Jesus Christ of Latter-day Saints in the southern hemisphere. It was dedicated by the church’s president, David O. McKay. Construction had begun at Temple View, just west of Hamilton, in December 1955. The project included the building of Church College, a private secondary school. Paid construction workers were joined by 500 labour missionaries. Trade union leaders sought meetings with church leaders to insist that the missionaries be paid award rates. They were told that missionaries weren’t paid, but received 10s each week (equivalent to about $25 in 2019) for personal necessities. Additional labour was supplied by church members from around New Zealand who visited for week-long assignments. Each of the 16 districts also raised £1000 ($50,000) each year to sustain the labour missionaries. Church College closed in 2009 after the church decided to focus its educational efforts in the developing world. The Church of Jesus Christ of Latter-day Saints was founded in the United States in the 1820s by Joseph Smith Jnr. Today it claims a worldwide membership of more than 13 million, nearly half of them in the US. Mormon missionaries arrived in New Zealand in the 1880s and enjoyed some success in Māori communities. In 2013 there were just over 40,000 Mormons in New Zealand. We have 8 biographies, 2 articles, related to Mormon temple opens in Hamilton.